When engaging with a prospect, every bit of information helps. Unfortunately, sales reps rarely have the time or resources to scour the web and find all the informational nuggets valuable to the deal. In addition, modern purchase decisions are generally made by a buying committee — so reps need to do the additional work of mapping out the key stakeholders within an organization and understanding the needs of each person to drive a deal forward. But thanks to the rapid innovations in information processing, sales reps can now get actionable, real-time insights on the people they sell to. To make this data truly useful and actionable for salespeople, sales intelligence should meet three criteria. Most sales organizations are familiar with the concept of intent data. A rep may look at a lead’s activity log to see what web pages a lead has visited on the seller’s website to see what stage of the buying cycle a lead is in. Engagement data from actions taken on your website or with your marketing emails is known as first party data. Unfortunately, most sales reps aren’t using enough sales intelligence. More importantly, their sales intelligence isn’t coming from enough sources. New software automatically gathers data from many sources and delivers buying signals to sales reps — without interrupting their day-to-day routine. For example, some data providers can crawl news sources — news sites, financial filings, and public pages on social media networks — to look for buying signals like key executive hires, new offices, product launches, or rounds of funding. Companies that may be good targets will be flagged automatically, and their relevant updates will be shown in a feed. This helps reps surface accounts who may be receptive to their outreach and gives them a reason to reach out. Some of these solutions can also identify new contacts within each account who fit the seller’s buyer personas. Other data providers can deliver a list of accounts who are showing surging interest in a salesperson’s product category. These data providers use cookie data on websites or tags on devices (i.e. tablets, smartphones) to figure out which IP addresses or devices are hitting certain web pages. They scan the content of the web pages to determine the primary topic of each piece of content (i.e. “networking equipment”) and use reverse-IP lookup to determine the company a given IP address belongs to. These data providers have developed algorithms to determine when a company is showing a greater than normal interest in a certain topic or product category. However, while account level insights can grease the wheels of the sales process, reps still need to engage with individuals within these companies. This is where individual, contact-level intent data comes into play. Prospects who engage with your company directly by visiting your website, downloading your content, or opening your emails. However, most buyers are not identifying themselves or leaving their contact information in the early stages of a buying cycle. Sites that require users to register in order to view in-depth content on specific business or technology topics. BrightTalk and TechTarget are sites that fit this category. These places can provide strong buying signals, but volume tends to be low since people must come to these sites and register. Social networks like Twitter, LinkedIn, and Quora, where buyers engage with brands, talk about professional conferences and events and share content from industry influencers. The advantage of getting intent data from social networks is twofold: The information is public, and you can gather buying signals on a much wider set of people. There are 2.1 billion search queries every day on Twitter alone. There’s technology available today that can analyze activities on social networks in real-time, connect people’s social profiles to their professional identities, and provide real-time insights into the topics and products they are interested in. At this point, only 34% of sales leaders can seamlessly prioritize sellers’ engagement activities in a data-driven way. To drive meaningful actions, sales intelligence should be integrated into a sales engagement platform or CRM. While only 25% of sales leaders use a sales engagement platform today, 77% see a significant value in having a single sales platform for automating communication, prioritizing activities, capturing data, and surfacing insights. The other important aspect of making sales intelligence useful for sales reps is to give it context. 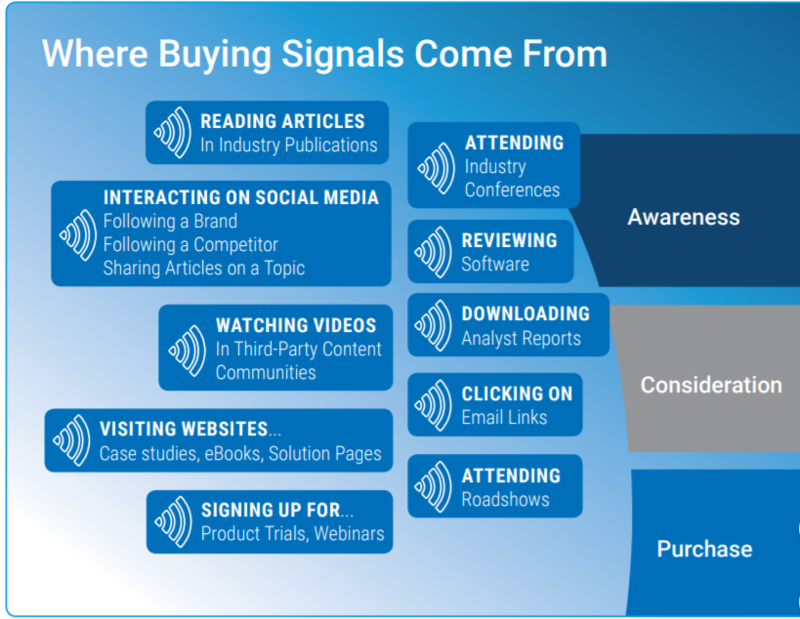 Intent data should be categorized by the stage of the buyer’s journey it maps to. Salespeople should also be provided with resources or scripts to engage with leads no matter what action they take. In many cases, the first rep who contacts a prospect is the one who wins the deal. Most reps also know that company needs can change at a moment — a prospect can go for months without needing anything and then suddenly start to shop for a solution to fix an immediate problem. This means that in order for sales intelligence to be useful, the information needs to be in real-time. Buying signals collected from social networks tend to be extremely timely. By integrating intent-based insights from social networks into a CRM system or a sales engagement platform, your sales reps can take actions right away and reach their prospects sooner. Sales take time. While your salespeople will be working with different prospects day-to-day, following up with them over several weeks or months, your sales intelligence tool should never stop gathering insights and surfacing relevant signals that can help reps identify new opportunities and drive deals forward. By collecting data from the broader web and social networks and surfacing insights to your sales people at the right time, you will greatly improve their productivity and help them engage the right people and close more deals.